A GRAPHIC novel which tells the story of a soldier’s return from the war in Afghanistan has been described by war veterans as “absolutely brilliant”. Dougie’s War went on sale yesterday and tells the story of Dougie Campbell, a veteran of the war in Afghanistan returning home to the south side of Glasgow. The novel depicts his inner struggle to adjust to civilian life as he battles with his memories of the war. It is the first release by independent Glasgow publishers Freight with words by acclaimed novelist and biographer Rodge Glass and pictures by artist Dave Turbitt. Mr Cruickshanks, who served in the Royal Navy in the Falklands War, said: “I think it’s absolutely brilliant. I’ve read it once only but I think I need to go back and read it again just to pick up on the finer points. Mr Cruickshanks was approached by Rodge Glass to help him put the novel together. He added: “We chatted about what armed service veterans feel like when they come out of the services and about trying to integrate them back into the community when they’ve left. “I was in the Navy so I came out of there into civilian life. I had an injury to my knee so I got a medical discharge and Rodge and I spoke about a character that would maybe do the same sort of thing. Shaun Davidson served in Northern Ireland with the King’s Own Scottish Borderers and he also thinks that the graphic novel is a great way to reach a wider audience. He said: “It’s not a long story and because it’s in a comic form it’s easier for people to understand. If you put a lot of it into words then a lot of people are not going to bother reading it but because it’s graphic it might appeal to the younger generation as well. Dougie’s War is inspired by the classic 80s World War One comic strip Charley’s War. This was the first graphic novel to explore the reality of war and what was then called shell shock. Dougie’s War highlights the Post-traumatic Stress Disorder (PTSD) time-bomb facing the UK. Rodge Glass said: “We ask our service men and women to do things and witness things the rest of us cannot imagine. They are trained to operate in the harshest and most stressful environments. But medical research shows that the effects of those experiences can be deeply damaging. 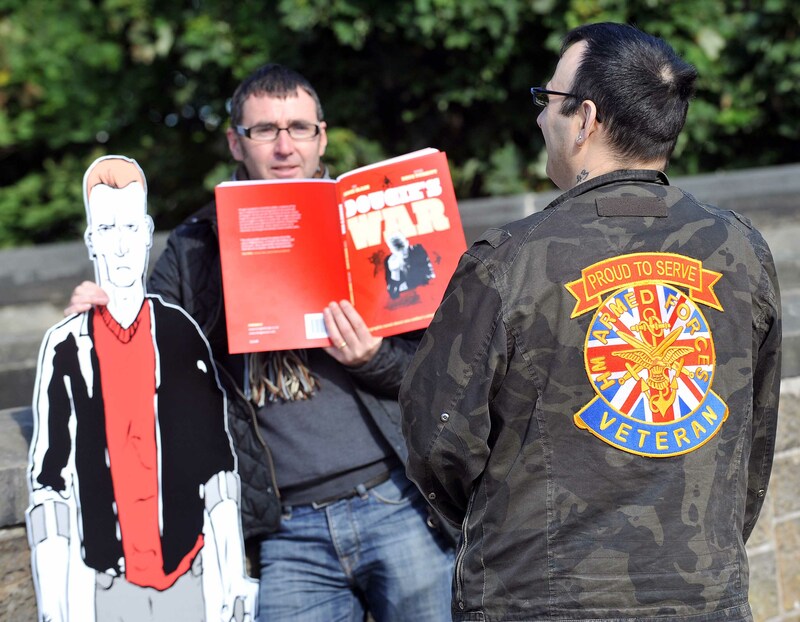 Gordon MacRae, head of communications and policy at Shelter Scotland, who are targeting veterans in need of help, said: “The graphic novel depicts an all too familiar scene and is a great way of reaching former members of the armed services who are too often forgotten about when they return from the theatre of war.